As we reported previously, the game is the work of our friends in Boston at Harmonix, the same developers of other musical/interactive games like Frequency, Amplitude, Karaoke Revolution and EyeToy: AntiGrav. 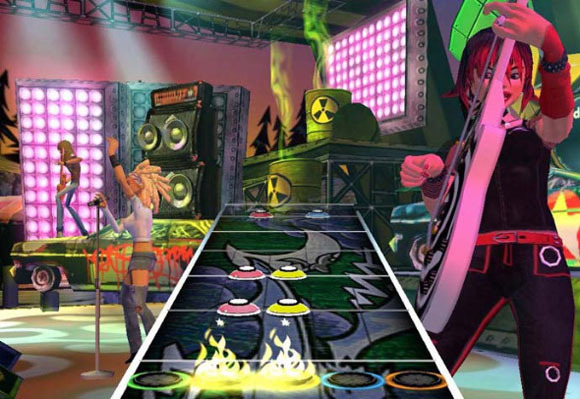 The hardware controller is the work of RedOctane, the favored maker of PS2 dance pads, and even Gibson Guitar has gotten in the act by licensing classic guitar models. What makes Guitar Hero so much fun is the PS2 controller it ships with. Instead of mashing buttons on a game controller, you can strap this toy on your shoulder and “strum” a paddle where the strings would normally be. No real frets, just buttons, but it’s still strangely amusing thanks to clever game design — see Gizmodo’s recent hands-on. One controller ships with the US$70 game; another one will cost you $40. Now, for the part you really care about, which doesn’t even require a PlayStation. PlayStation – to – USB adapters are easy to find these days, so you can plug this baby directly into your Mac or PC. (Make sure you don’t confuse that with a PS/2-to-USB adapter, as in IBM’s old PS/2. Look for PSX to USB.) Then you need some way of handling the data. The easiest is to use the “hi” (human interface) object in Cycling ’74’s Max/MSP, which is also built into their new Hipno plug-in library. In the spring, you could download a free executable Max patch called PSmaX that did the work for you with or without Max, but that link is now defunct. So, you could bug me to create a new one and share it. Let the bugging commence. 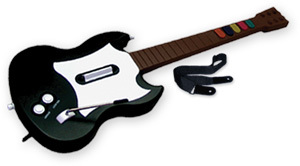 And soon we’ll all be jamming using a fake toy guitar. Excellent.